Adam Becker?s new book?What Is Real?? 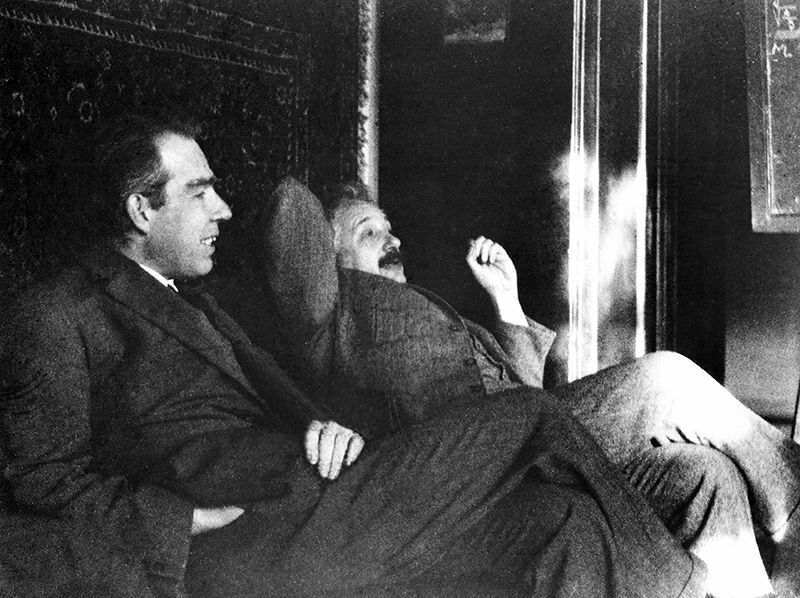 The Unfinished Quest for Meaning in Quantum Physics?revives a mid-century debate about whether Niels Bohr, and his so-called ?Copenhagen Interpretation? of quantum theory, tells it like it is. ? ?I will say a few words about one of the counter-voices in that debate: David Bohm. If you do not know anything about the quantum mysteries of the early 20th?century, imagine a scientist confronting phenomena that indicate sub-atomic particles are communicating with one another from a distance, or that they are behaving like waves when they are left alone and like billiard balls when they are measured. Such puzzles forced science into an epistemological quandary:? Is reality itself indeterminate?? Or is the experimenter prevented from knowing with determinacy, because he can go no further into the quantum realm?? The riddle of nature became a probability; Schr?dinger?s phantom cat replaced the sphinx. Niels Bohr concluded that microcosmic (quantum) and macrocosmic (Classical, Newtonian) measurements were irreconcilable?a conclusion that is strangely reminiscent of a Neo-Platonic ?two-world? view.? The scientist himself (who must follow the laws of Newtonian physics) is tragically fragmented from the particles he examines (which must follow the laws of quantum physics). ?Bohr adamantly resisted the idea that there might be ?hidden variables? that would allow quantum physics to unite these two perspectives, and so, to articulate the particle-wave duality as an undivided whole. So, in 1952, when David Bohm proposed a theory that involved such ?hidden variables? (an extension of an earlier theory of Louis de Broglie), he was met with extreme opposition.? Bohm?s doctoral advisor, Robert Oppenheimer, called Bohm?s ideas, ?juvenile deviationism,? saying that, ?if we cannot disprove Bohm, then we must agree to ignore him.?? Perhaps the hostility had to do with communist accusations against Bohm during that time, though it is hard to see why that should have influenced the validity of his scientific hypotheses. 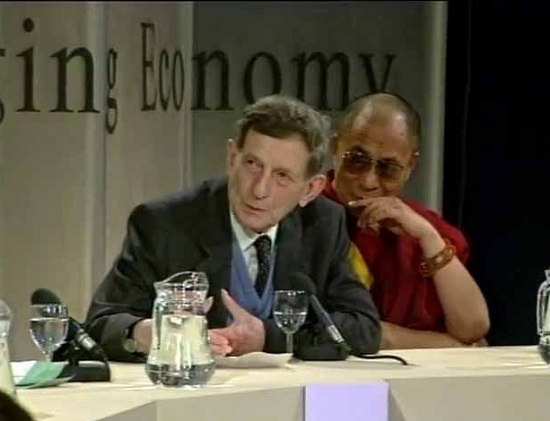 David Bohm and the Dalai Lama. Photo courtesy of the Scientific and Medical Network. In a later book, published in 1980, Bohm claims that the scientific way of thinking is stereotypically stubborn.? Scientists cling to their theories?not acknowledging that the insights that lead to these theories cannot be explained by the theories (and, thank goodness insights cannot be explained, otherwise science could not progress). ?Science tends to forget the whole that motivated its partial view.? The danger is thus that the scientist ?ceases to regard the resulting divisions as merely useful or convenient and begins to see and experience himself and his world as actually constituted of separately existent fragments? (Wholeness and the Implicate Order, 3). Bohm offers a similar assessment of intelligence versus thought.? Intelligence is precisely the thing that cannot be contained in any thought; it is, rather, the wave that binds the particles of thoughts together. ?Even the subject-object structure of speech falls prey to the danger of fragmentation.? Nouns tempt us into believing that reality is composed of irreducible noun-atoms.? But Bohm sees nouns as the illusory abstractions of a more fundamental, verbal wholeness, which pilots speech forward.? Although the word “atom” literally means “un-cuttable,” atoms were found to further divide into electrons, and electrons into quarks; the search for elementary particles seems to constantly elude us.? Lucretius was already wondering in the 1st c. B.C. how there could be variety in the elementary. Following the pre-Socratic Heraclitus, Bohm posits that flux is always implicit in thinking but can never be made explicit. ?Poetry is thereby better than simple sentences at alluding to the fluidity of thinking.? ?One might say that Bohm?s interest in the poetic fluidity of speech is equivalent to his interest in a ?hidden variable? theory of quantum physics. ?Nature,? said Heraclitus, ?is fond of hiding herself.? “All thought is broken up into bits, like this nation, this country, this industry, this profession?? Thought has developed?traditionally in a way such that it claims not to be affecting anything but just telling you the way things are. Therefore, people cannot see that they are creating a problem and then apparently trying to solve it. ? ? (David Bohm in “From Fragmentation to Wholeness“).? Where there is no longer recourse to myths to repair thinking’s own divisions, thinking becomes alienated from itself. Bohr?s discomfort with the ambiguity of the particle-wave duality led him to assume that the indeterminacy was reflective of an incompatibility, rather than concentrated in what-we-do-not-yet-know about the whole universe. ?On Bohm?s model, knowledge of ignorance accompanies every particle in the form of a so-called ?pilot wave.?? The motion of one particle depends upon the positions of all the others (in the entire universe). ?Interestingly, for Bohm, this holograph of the whole in the particle is not solely mechanistic, but has a corollary in human thinking.? After all, science cannot finally be interested in “atoms,” however evanescent they may be; it is interested in atoms because it is interested in everything.